Australian Pump Industries has released a new range of high pressure motor pumps designed specifically for firefighting at sea. Part of the Aussie GMP marine pump line, the new model features heads as high as 80m, ie up to 106 PSI, with flows as high as 1,250L per minute. Called the B3ZPM-A/B T, the new pumps are manufactured from nickel aluminium bronze, and are designed on a close coupled Monobloc configuration. They are fitted with open style multi-blade impellers, suitable for pumping seawater. Their self-priming design provides them with the ability to draft water from the depths of six meters. That feature eliminates the need for additional priming equipment. The shafts are manufactured from stainless steel in AISI 316 grade. They are compact in design, and come close coupled to heavy duty electric motors in 2 pole, 415 volt, 50 hertz running at 50 or 60Hz option. 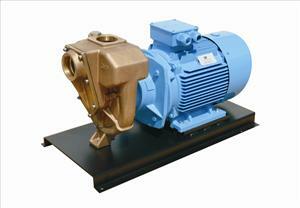 The combined pump motor units are compact and easy to install, coming on a steel mounting base. The pump achieves its self-priming by having a non-return valve located in the front of the body. The valve is easily accessible for service by simply removing the front mounted suction port. That also provides easy access to the pump in the event of a need for clean out of any contaminants. "The new pumps are claimed to represent a major breakthrough in terms of value for money, and are made to strict ISO9001 Quality Standards," said Neil Bennett, Aussie Pumps product manager. The product is expected to be of interest to operators of trawlers, workboats, tugs, barges and even navy, customs or police patrol boats.